As the end of January rapidly approaches, I’ve been thinking about my New Year’s resolutions. Am I committed to them? Am I on the right path? Have I been achieving them? Did I actually give up on some of them too easily? The New Year brings optimism. It spurs you to change what you didn’t like in the previous year, and to continue doing the things that were good. But how do we maintain that optimistic spirit throughout the year? The promise of the new? The hopefulness? Perhaps it is not the new that brings the hopeful feeling, but rather the act of sitting down and really thinking about what we want to do in the future. It is the act of being purposeful or thoughtful about how we spend our time, that is actually what gives us the good feelings. what we should keep doing? In the GRC realm, this planning and thought process is already baked into risk analysis and other strategic activities. So, let’s embrace that our work actually mandates that we continually feel hopeful, and optimistic—giving us the power of new all the time. If we view these activities as something that is actually helpful, actually inspirational, maybe it can help spur the important changes we need in our workplaces (or help maintain the behaviors and activities that are already working well). At OCEG, we have a name for this act of setting resolutions. We call it our “principled purpose.” A principled purpose is perhaps the most basic starting point for principled performance. Defining your highest purpose via mission, vision and values to guide everything that the organization does. During these times of setting purpose with mission, vision and values, take a moment to consider whether you have the right people accomplishing them. Do we have the leadership, the workforce and extended enterprise populated by principled people with strong character and a commitment to competence who consistently direct their energies toward a principled purpose? This resolution setting—thoughtful, purposeful planning– is actually going to continue to motivate you to stay on the right path all year long. 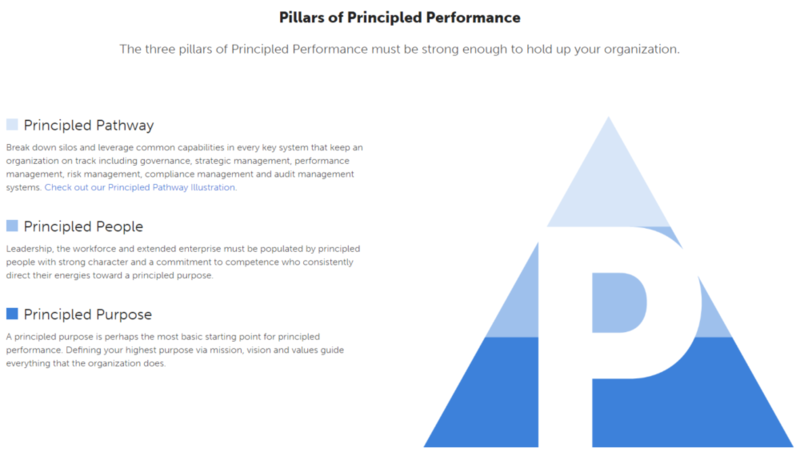 Learn more about the Pillars of Principled Performance, including Principled Purpose and improve your business today.